Washington Township, NJ Plumbing, Air Conditioning, & Heating Services | SPS Mechanical Inc. Technician performed furnace cleaning of cabinet and blower wheel. Home Performance With Energy Star, insulation, air sealing, duct sealing and new energy efficient HVAC equipment. If you are looking for plumbing, heating and air conditioning services in Washington Township, NJ, call SPS Mechanical. We offer plumbing installation, replacement, maintenance and repair services, and we offer these same basic services for your heating and AC systems as well. For emergency plumbing and HVAC repair services, call any time for 24 hour repair. We can also provide routine maintenance to keep your home efficient and comfortable all year long. Schedule a service today! For all of your Washington Township, NJ plumbing services, call SPS Mechanical. We install new plumbing fixtures, offer bathroom plumbing and remodeling services, and much more! We are here 24/7 for repairs, and we provide drain cleaning and routine maintenance. Call today to learn more about our comprehensive services. Do you need a plumbing repair technician in Washington Township, NJ or the surrounding areas? Call SPS Mechanical. We are here any time night or day to offer you emergency plumbing repair services. Our expert plumbers can fix any problem. We are dedicated to providing fast and reliable results. Call the Washington Township, NJ plumbers at SPS Mechanical for if you have any problems with your home’s plumbing. At SPS Mechanical, we offer comprehensive Washington Township, NJ heating services to help our customers get exactly what they need. That’s why we offer an extensive line of heating systems, and with one of our installation services, you know that your heater will offer lasting results. Start saving energy with a new high–efficiency heating system. Call SPS Mechanical today! SPS Mechanical provides Washington Township, NJ heating repair for customers throughout the area. Whenever your heater shuts down, call the experts at SPS Mechanical. We respond to service calls any time night or day so that our technicians can resolve the issue and get your heat working again. Don’t hesitate to call SPS Mechanical for all of your heating repair needs. Although a good heater is important during the winter in Washington Township, NJ, air conditioning is just as important in the summer. That’s why at SPS Mechanical we offer a wide array of AC services, including installing a high–efficiency air conditioner to help you get more efficient cooling in your home. Call today to learn more about all of our AC services. Are you looking for air conditioning repair in Washington Township, NJ? Call SPS Mechanical any time! We offer around the clock AC repair, and our technicians can repair all makes and models. Don’t hesitate to call us for your next service. We are here to provide you with all of your air conditioning repair needs. Call SPS Mechanical today to learn more about our plumbing, heating and air conditioning services in Washington Township, NJ! Came out same day, very professional. Had experience with many companies in the past and by far the best service. Would recommend. I think your mechanic did an excellent job and was helpful with other information. Great service. Dino was very helpful at explaining all of my options and very thorough with his work. His cleanliness while he was in and out of our house was also very much appreciated! The technician was on time and explained all my options. He used a drop cloth and cleaned up after himself. Great job! My air conditioner wasn't working. Upon calling Sps , I received the best customer service, They genuinely care. I was told I would get a call back shortly. It was only a few minutes. I was given an appointment within 2 hours on a Friday! Amazing, Dino was running about a half hour late and I was called with the update way before my scheduled time. I understand they estimate arrival time based on previous job He even arrived earlier than expected. Great communication. Dino was professional, kind, and courteous. He explained everything he was doing. In only a few minutes, he knew exactly what the problem was. He fixed it in no time flat! The cost was very reasonable! I highly recommend SPS. From the time you call, until your problem is fixed, you will experience kind knowledgeable people who know what excellent customer service is! I trust them. Thank you all for your outstanding service! Ken is a hard worker and he did an excellent job. Highly recommend him. He made sure I had the heater working by the end of the day. Great Job! Excellent company to work with. 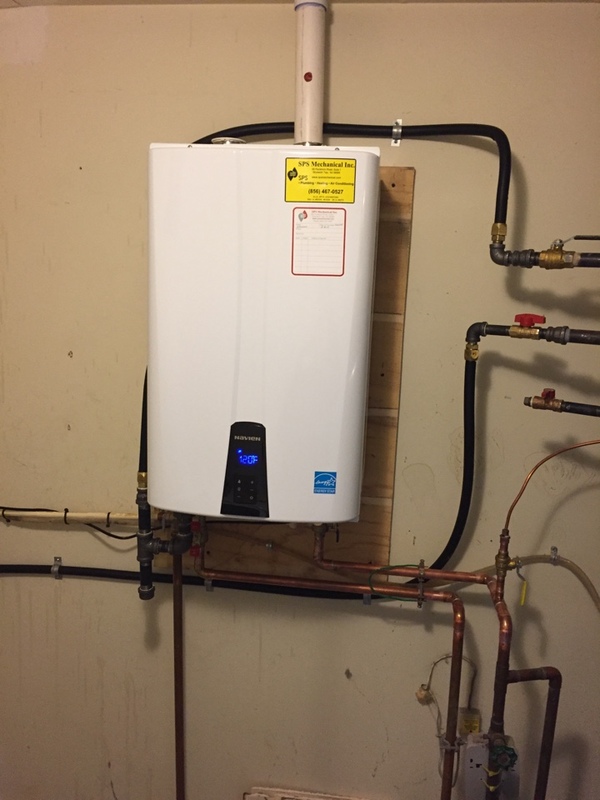 The representative explained everything that was necessary to convert to a tankless water heater and the estimate was very detailed. I would recommend this company. Found SPS Mechanical on a google search when my toilet in my shop was leaking. They send out James Whitten out. He arrived ON TIME for our 230 appointment. He worked clean and neat, cleaning after himself when needed. Also, he informed us (and supplied pricing) before he moved forward. Turned out we had a large blockage in our pipes to the septic tank. Jim was very thorough in the entire inspection and clean out process, even into the re-assembly of the toilet and whatnot. I will be (hopefully not too soon) be using SPS again, and I will be asking for Jim. work was fantastic and great service. Nef has been out to my home several times either on for the maintenance service or for an emergency after the last big storm we had. He is very professional , knowledgeable and willing to explain anything that I don't understand. He is a great asset to SPS! Home performance with energy star. Air sealing and installing high efficiency heating and air conditioning.